The Scott Duncan Hut is the fourth hut on the Wapta Traverse which is a classic Canadian ski traverse located in the heart of the Rockies just outside Lake Louise Alberta. There are four huts along the way to make the journey more enjoyable — the Peyto Hut, the Bow Hut, the Balfour Hut and the Scott Duncan Hut. Backcountry skiing and ski mountaineering objectives around Scott Dunca Hut are glacier based so you need good white out navigation skills and crevasse rescue skills. 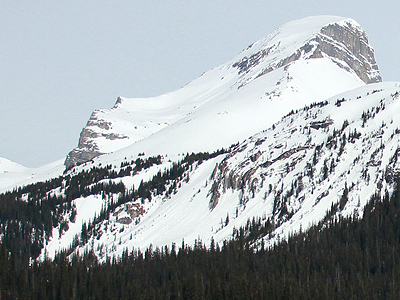 Within a short ski tour you can access Mt. Balfour, Lilliput Mountain, Mt. Daily and oc course Mt. Nile. We want to hear about your adventures in the Rockies so don’t forget to post a trip report in the backcountryskiingcanada.com forums. If you have a new route in the area you want to share, mouse-on over here. N-Joy. For a full listing of backcountry huts, cabins and lodges (including all of the Wapta Traverse huts) check out the Rocky Mountain Lodging page over here. For all the details on how to complete the Wapta Traverse have a look on the Wapta Traverse page. The Scott Duncan Hut is the final hut along the Wapta Traverse (if you complete it in the traditional north to south direction) so the skiing into Niles Creek can be accessed no only from the Scott Duncan Hut but also from the West Louise Lodge on Highway 1. From the Scott Duncan Hut you will have a 5km walk via the Scheisser/Lomas route which heads towards Sherbrooke Lake. Leaving the Scott Duncan Hut ski around the cliff band immediately in front of the hut and then head in a southerly direction using Mt Daly as a handrail on your left and Mount Niles as your target. After a few kilometers you will come to a small peak, you will want to de-skin here and ski to the right of this peak and descend down to the easterly shoulder of Mount Niles. Continue due south on a very large bench that wraps around to your right (west). The skiing gets good here as the pitch increases but be sure to ski far right until you know that you above Sherbrooke Creek, if you don't go far enough west you may get cliffed out in the trees. Ski down through the trees until you find Sherbrook Creek bed and then follow this out to Sherbrook Lake if you want more turns and the coverage is good. To get back to the Scott Duncan Hut go back the way you came. From the West Louise Lodge on Highway 1 you will ascend a few kilometers through the woods on the summer trail that starts just behind and to the left of the West Louise Lodge. The trail should be evident most of the winter due to the amount of traffic that the Wapta Traverse sees, it will head in a westerly direction wrapping gently around the shoulder of Paget Peak. When you break out of the trees you will see Sherbrook Lake, ski across the lake and then up the Sherbrook Creek bed until you are out of the trees. At this point you need to head East staying above the trees and wrapping around right for some time as you gain elevation and eventually can follow the draw farther up into the alpine. As the terrain starts to bench out you can switch over and ski back down. There is no Crevasse danger on this route however be concerned with avalanche hazard from above and ensure you know the current conditions. ACCESS: From Scott Duncan Hut on the Wapta Traverse or West Louise Lodge on Hwy 1.